The Grand Ballroom at the Four Seasons Hotel Philadelphia was transformed into a dramatic black wedding ceremony. Set in-the-round against a backdrop of modern black and white mid-century inspired screens, the Jewish wedding ceremony was visually impactful. Our square iron Chuppah was covered with a lush display of bright white and vibrant green flowers, and pillar candles added soft, romantic light to the proceedings. After the ceremony, guests were invited to enjoy cocktails in various spaces of the hotel, including this stylish tent we installed on the Ballroom Terrace. Returning to the ballroom for the wedding celebration, guests were seated at long dinner tables upholstered with white fabric. 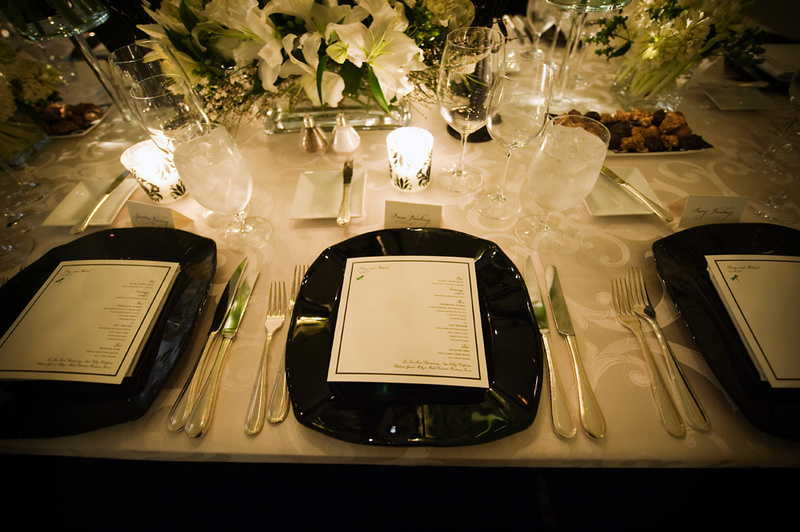 Black chandeliers, candelabra, dinner plates, cut crystal votives, table number frames and reception chairs gave sharp contrast to the white linens on the tables. White flowers were used throughout, including white amaryllis, ranunculus, roses, lilies and hydrangea. Nature provided the bright pops of green the bride wanted in the stems of the flowers massed together in square glass vases. The final result was pure modern magic!